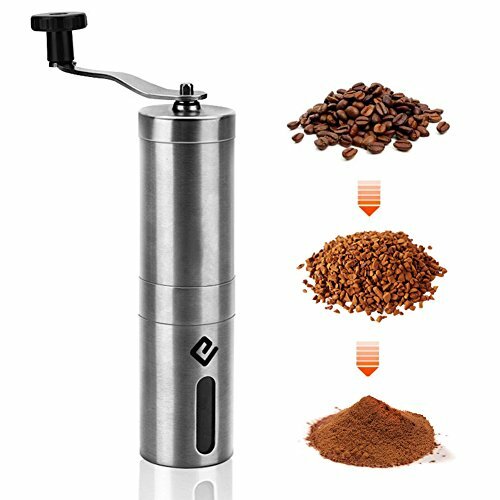 CHARMINGEL Coffee Bean Grinder specially designed for Coffee Lovers to make hand-made, fresh coffee anywhere, any time without long power cords restrained compare to electric one. NO battery required either. Drink various original flavor freshly ground coffee from your special collected coffee beans definitely is a great pleasure at your leisure or work time. Control the fineness of your grinding coffee easily achieved with this Coffee Grinding Machine. Space Saving Design: Just put it in your bag or backpack for any travel. Sipping fresh-made coffee while you were enjoying wonderful scenery on the road. CHARMINGEL provide worry-free friendly customer service to guarantee EVERY customer HAVE NO worries while you using our products! LIFETIME Quality Warranty for all items we sold! If you any issue or not happy with this product, PLEASE contact us for a NEW replacement or a FULL refund! Materials: 304 Stainless Steel, Ceramic, Superior ABS. ☕ [Drink Fresh Coffee Everyday]: CHARMINGEL Coffee Bean Grinder allow you drink the freshest coffee everyday in the morning and every moment when you need to sit down for relaxing in home or office. Get cheer up in the middle of your work break time by grinding some 100% original flavor coffee beans, let you have the possibility to taste the richest aroma, fresh of hand-ground coffee. ☕ [Precise Control]: Adjustable control system ensure you control your coffee fineness in 100% precisely for the purpose making different types of coffee. Provide more choices to drink your coffee, enjoy high-grade life style. ☕ [Perfect Travel Companion]: Portable and compact size make it easy to carry around with coffee lovers, just simply put it in your backpack, take adventure with you for any short or long distance travel. Make sure you can drink fresh coffee anywhere along with wonderful scenery. ☕ [Build to Last Quality]: All of Manual Coffee Grinders are not made equal. CHARMINGEL Coffee Burr Mill crafted in high-quality 304 stainless steel, it never rusts compare to those cheap ones. Create coffee power in controlled fineness consistently. ☕ [Grinds Many More]: CHARMINGEL Hand Crank Coffee Mincer not only grinds coffee beans, but also can grind some other food ingredients. For instance; spices and herbs, to make your food tastier. AFTER SALES SERVICE: LIFETIME Quality Warranty for this product! If you have any questions about this product by CHARMINGEL, contact us by completing and submitting the form below. If you are looking for a specif part number, please include it with your message.